The Shard is the tallest building in western Europe. From February 2013, the public will be able to visit floors 68 to 72, where they will experience an amazing 35-mile vista over London and beyond. 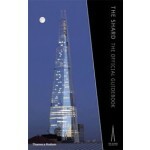 The book sets The Shard in the context of its location close to an area associated with Chaucer, Shakespeare and Dickens – before outlining its design principles and construction story. Also included are Q&As with both its architect, Renzo Piano, and developer, Irvine Sellar, and fascinating facts and statistics relating to this extraordinary building. Central to the book’s purpose is a series of twelve double-page panoramic photographs of the view from The Shard that have been annotated to identify London’s key buildings, monuments and landmarks; and a beautiful sequence of dusk shots, offering a 360º panorama of the skyline. Elegantly designed, the book will intrigue and appeal to everyone who lives in or is a visitor to London.